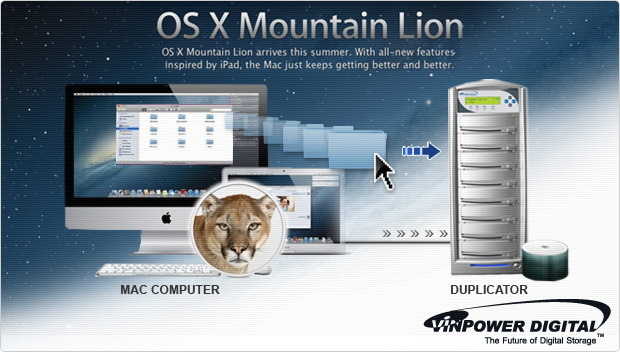 Vinpower’s Mac Compatible Copy Connect feature is now compatible with the latest Apple Operating System X; Mountain Lion. Computer operating systems are continuously being upgraded to provide new features and make them stronger against viruses and hackers. However, this creates a legitimate problem for companies that make hardware that interacts with the operating systems in order to allow the computer to work with or function for the device. With the introduction of the Apple Mountain Lion OS, Vinpower has been very busy updating our Apple driver for our Copy Connection feature to make sure it was compatible for greater flexibility with Mac users. Contact Vinpower today if you need a copy of the updated Mountain Lion driver to use in conjunction with your Vinpower or Xerox duplicator.